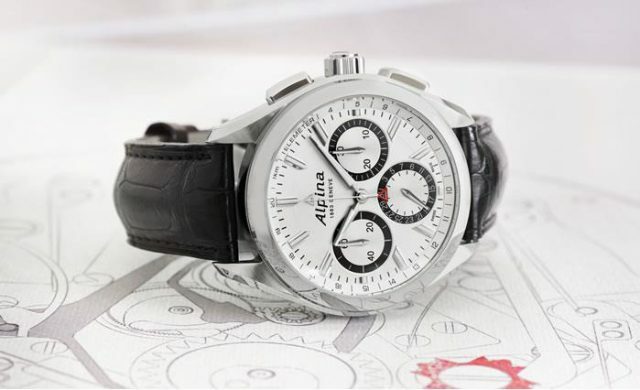 Alpina is no stranger to the chronograph. The traditional Swiss company has been familiar with pocket-watches and wristwatches endowed with an additional stop function for over a hundred years. Nevertheless – and in this respect, there is no difference between Alpina and other renowned Manufactures – the movements ticking away inside the cases were always bought in. Suppliers included Landeron, Minerva and Valjoux. Without exception, they all supplied movement blanks with a guarantee of quality, precision and reliability of operation. The fine finishing of the components, assembly, casing up and final checks were of course all carried out in our own workshops. In this way, the watchmakers gained a wealth of expertise in the demanding field of mechanical timekeeping. So working together with established experts was no accident. For every watch brand, chronograph calibres represent an immense opportunity that poses a real challenge. Chronographs of all kinds are generally based on perfectly standard watch movements, notably in a Lépine design with a small-seconds hand opposite the winding and setting crown. On wristwatches, this hand appears in a subdial at 9 o’clock. Watchmakers can mount this sophisticated mechanism, which enables time intervals to be measured without stopping the main movement, immediately under the dial or at the back of the watch. The position chosen has no influence on the stop function. Traditionally, the industry recognises two different modes of construction of a chronograph mechanism: integral and modular, fixed to the watch movement. The latter has the advantage of offering greater flexibility, as it can be fitted, after appropriate adaptation, to a wide variety of hand-wound and automatic calibres. Furthermore, the chronograph assembly can be pre-mounted and tested independently of the “power unit” used, and if necessary even completely replaced. This saves time and hence also costs. And now the spotlight is once more on Alpina. After an eventful 132-year history, the Manufacture is presenting the first chronograph developed and produced in-house. Over three years went by in the Swiss mountains between the initial concept and readiness for production. For the good reasons mentioned earlier, the technicians decided to adopt a modular construction for the new calibre AL-760. This step permitted the use of the reliable and robust, tried and tested AL-710 rotor calibre with a balance frequency of 4 Hertz, centre seconds and a date hand at 6 o’clock. This powerful movement, comprising 233 components (on which only 96 components for the flyback module) with a rotor operating in both directions and a 38-hour power reserve, is particularly suitable for a drive mounted at the front, immediately below the under-dial work. The ingenious construction of the chronograph mechanism is apparent not least from the fact that Alpina was able to create it from only 95 parts. Critically minded contemporaries may suggest at this point that such a small number of parts must imply loss of quality. This is by no means the case. On the contrary, the development team acted in accordance with a wise saying from Antoine de Saint Éxupéry: “Perfection is attained, not when there is no longer anything to add, but when there is no longer anything to take away.” As an adventurous pilot, the French poet knew what he was talking about. 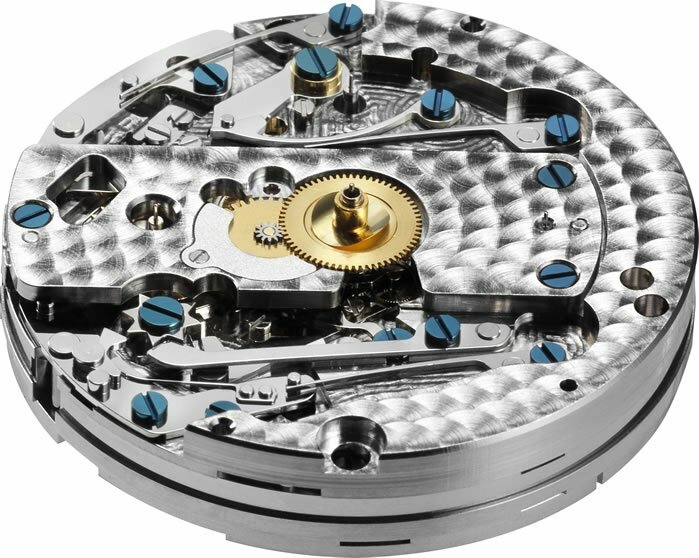 In the particular case of a highly complex chronograph mechanism, in which the assemblies have to work together to perfection, keeping to the vital minimum really makes sense. And it adheres to the dictum that nothing can break down and fail if it is not there in the first place! Actuating the chronograph push-piece above the crown for the first time demonstrates how thoroughly the functional relationships have been thought through. Protection against errors of manipulation is clearly perceptible in the resistance felt on starting. Nevertheless, the pressing action is extremely smooth. Of course, the same is true of the subsequent stopping and resetting operations. Repeating pressing of the start/stop push-piece causes slight pivoting of the clutch lever. The chronograph stops. At the same moment, for perfect legibility, a small locking lever ensures that the two stopping hands pause exactly at the last position chosen. If desired, this stop operation can be repeated as often as wished with the upper push-piece. This is known to specialists as a cumulative split. The chronograph will not be reset to zero until the push-piece at 4 o’clock is actuated. Here again, the ingeniously contrived construction of this newcomer among chronographs is evident. 4th – the use of non-rusting stainless steel for the highly robust case. All this and much more goes to make up the new “Alpiner 4 Chronograph Flyback”. Its sportily elegant stainless steel case with ergonomically shaped chronograph push-pieces, screw-down winding and setting crown, and scratch-resistant sapphire crystal measures 45 millimetres in diameter. It can withstand a water pressure of up to 10 atmospheres, equivalent to a diving depth of 100 metres. Following a long tradition, the screwed steel case back is decorated with the familiar Alpina logo. Looking at the right-hand side of the case, connoisseurs will immediately notice that the crown and push-piece lie on a straight line, despite the calibre AL-760’s modular construction. Safety and comfort on the wrist are ensured by either a sporty stainless steel link bracelet or an elegant strap in precious alligator. The designers configured the dial and hands with optimum legibility under all circumstances in mind. Super-LumiNova highlights facilitate use of the watch after dark. 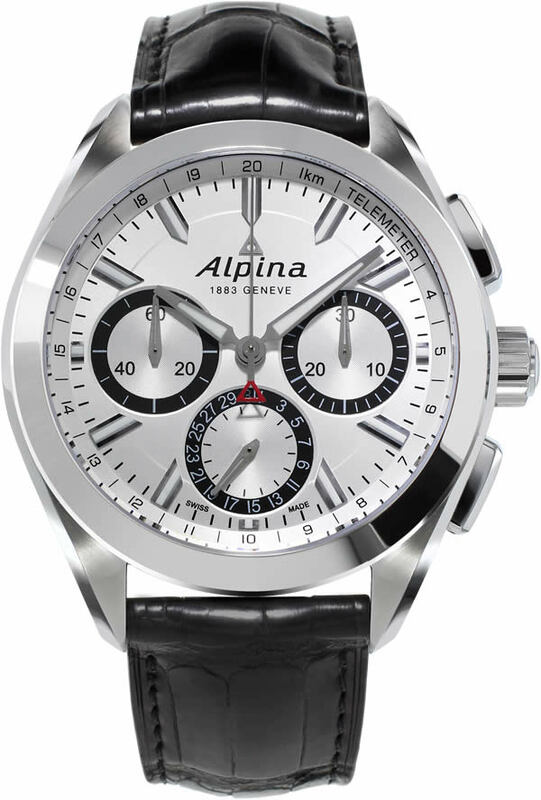 At Baselworld 2015, the Alpina watch Manufacture, founded in 1883, launched its first automatic chronograph produced in-house. With the new automatic calibre AL-760, the technicians made the considered choice of a modular mode of construction based on the tried and tested AL-710 with a winding rotor operating in both directions. The control mechanism of the front-mounted chronograph is distinguished by its ingenious construction, which achieves the highest degree of functionality with only 96 components. And it adheres to the dictum that nothing can break down and fail if it is not there in the first place! Special features of the new chronograph include a directly actuated flyback function. With this useful function, the 8th-second chronograph can be stopped and restarted from zero by pressing the push-piece just once. A counter at 3 o’clock adds cumulative times up to 30 minutes. Opposite, at 9 o’clock, the permanent-seconds hand rotates as usual. And incorporated into the Super-LumiNova-highlighted dial with the utmost harmony, the date hand is positioned at 6 o’clock. Of course, Alpina also made the hands luminous at night. The AL-760 movement beats at a frequency of 4 Hertz in its large stainless steel case, reminiscent of the legendary “Alpina 4” of 1938. The screwed case back bears the well-known Alpina logo. The wristwatch, available with a stainless steel bracelet or alligator strap, is water-resistant to a pressure of ten atmospheres. Faithful to its long tradition of creating mechanical calibers, Alpina manufactures, in its Geneva-based Manufacture, four in-house movements in-house: the Tourbillon AL-980, the World Timer AL-718, the Automatic Regulator AL-950 and the Small Date Automatic AL-710.